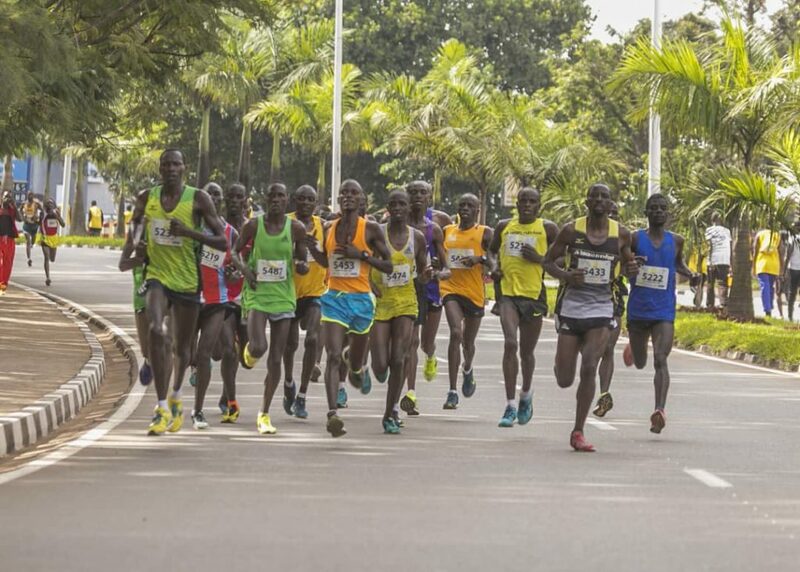 Rwandan athletes Salome Nyirarukundo and Noel Hitimana defied odds as they won the half marathon at the 14th edition of Kigali International Peace Marathon held on Sunday in Kigali City. 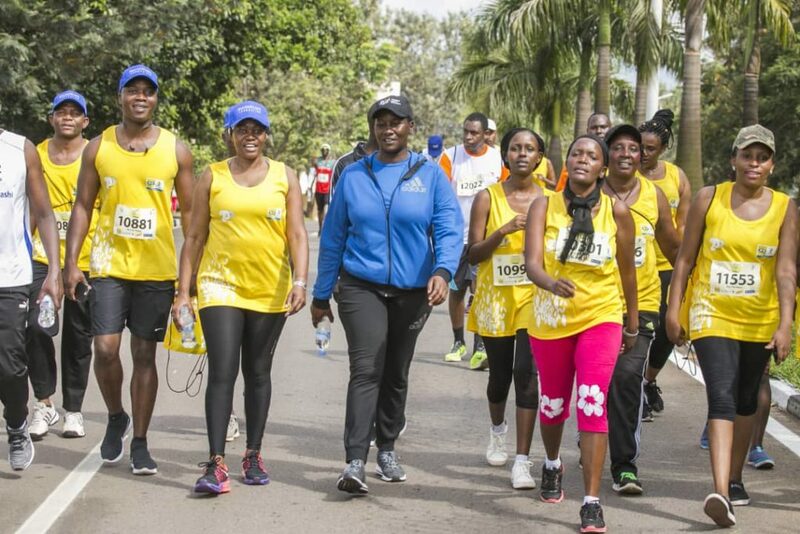 The Kigali international peace marathon was started 13 years ago in a drive to promote peace after the devastating 1994 Genocide against the Tutsi that claimed over one million lives in 100 days. 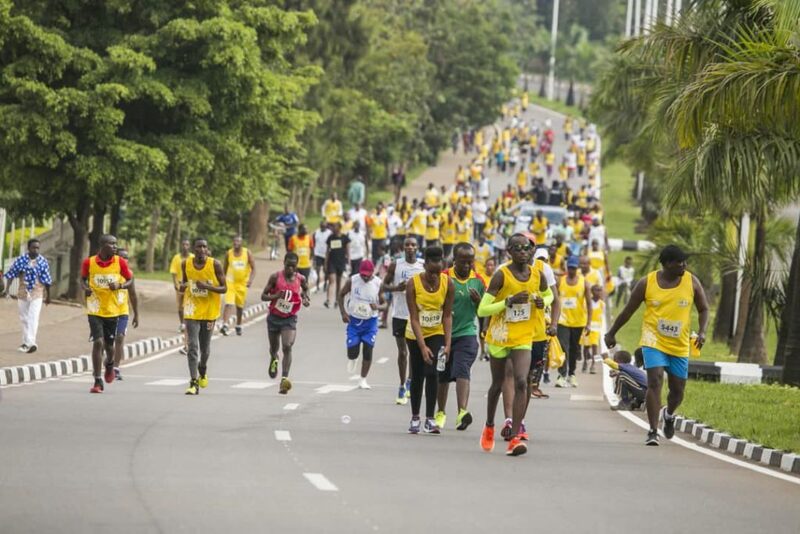 The 21km half marathon started at 7:30am from Amahoro stadium via RDB, Chez Ndegeye, Tigo center, Gacuriro back to ‘Chez’ Ndengeye and then back to Amahoro stadium while the 42km full marathon was twice the half marathon and started at 8:45am. 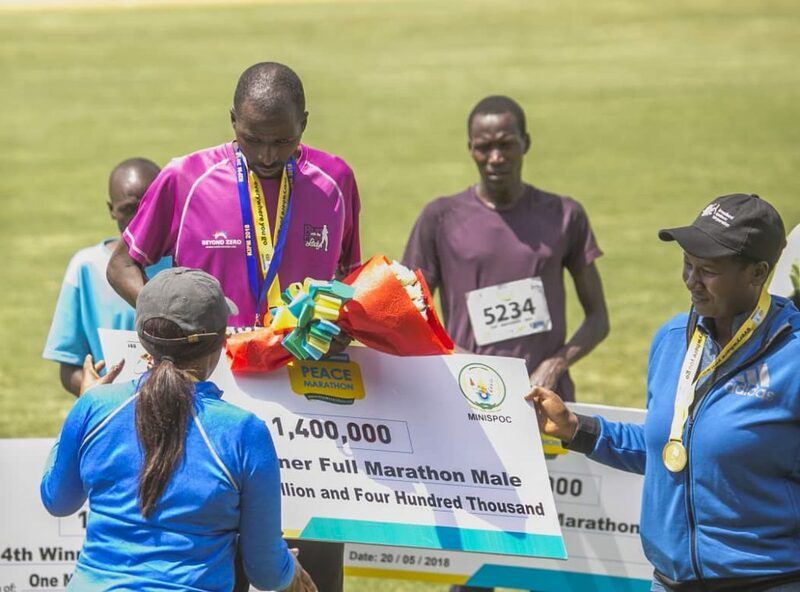 APR athletics club runner Noel Hitimana won the men’s category of the half marathon race as he beat Kenyan quartet the winning spot, clocking 01h16:16. Noel Hitimana, Half Marathon in men’s category. 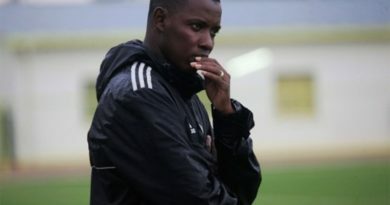 Hitimana came ahead of Kenya runner Kipsang Kipkemoi who clocked 01h17:01 who won silver and Moses Kingeitch who settled for a bronze medal in 01h17:13. 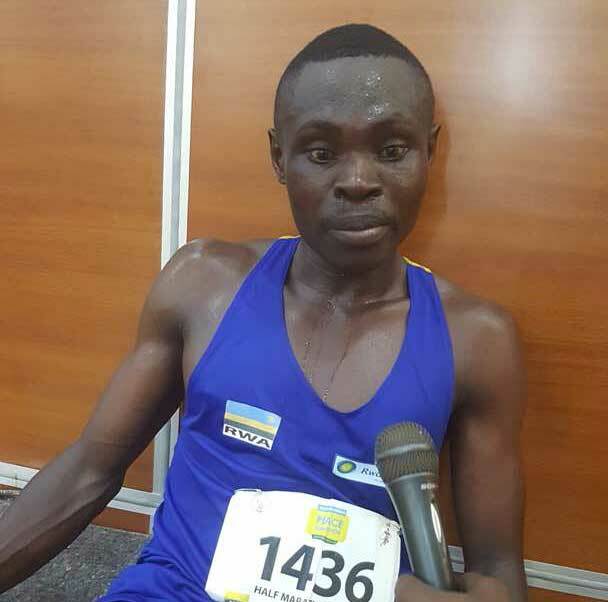 “It was a tough race but I am happy for edging out Kenyans to win a gold medal,” said Hitimana as he crossed the finish line. 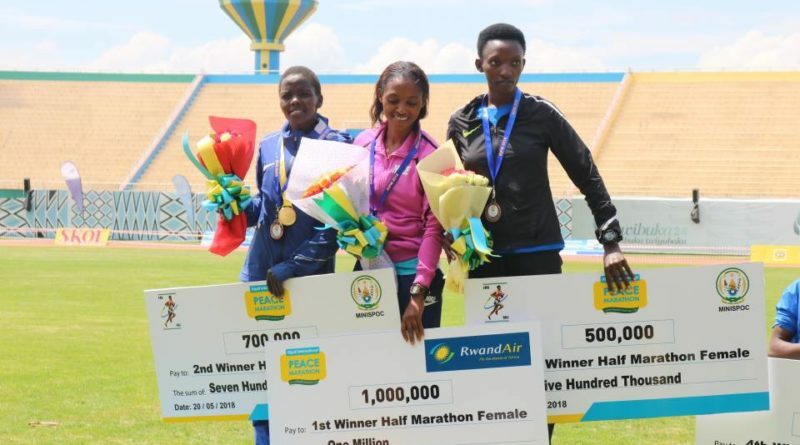 In the women category, Salome Nyirarukundo defended her gold medal in the half marathon as she clocked 01h32:35 to edge Kenyan Esther Chesang who won silver in 01h32:35 while another Rwandan Marthe Yankurije picked a bronze medal after clocking 01h36:10 respectively. 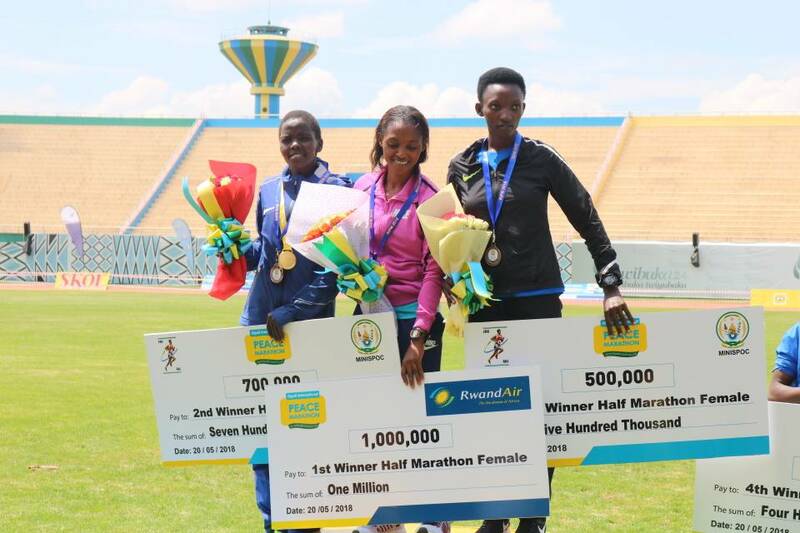 Salome Nyirarukundo(Middle) after winning half marathon 2018 edition of Peace Marathon. Nyirarukundo, 20, has been the country’s leading female athlete for the last two years, posting stellar performances and winning medals in different competitions in the country, on the continent and globally. 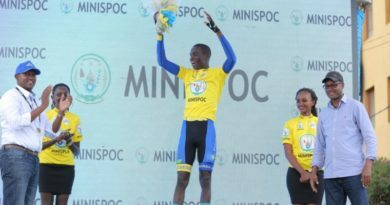 Her victory in today’s race has seen her become the first Rwandan woman athlete to win two gold medals at the annual event. 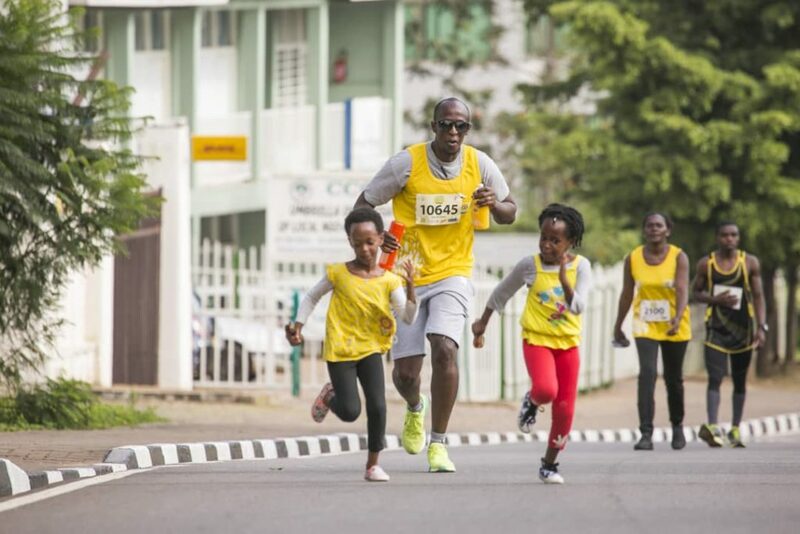 The full marathon race continued to be elusive for Rwandans since the inauguration of the Kigali International Peace Marathon. 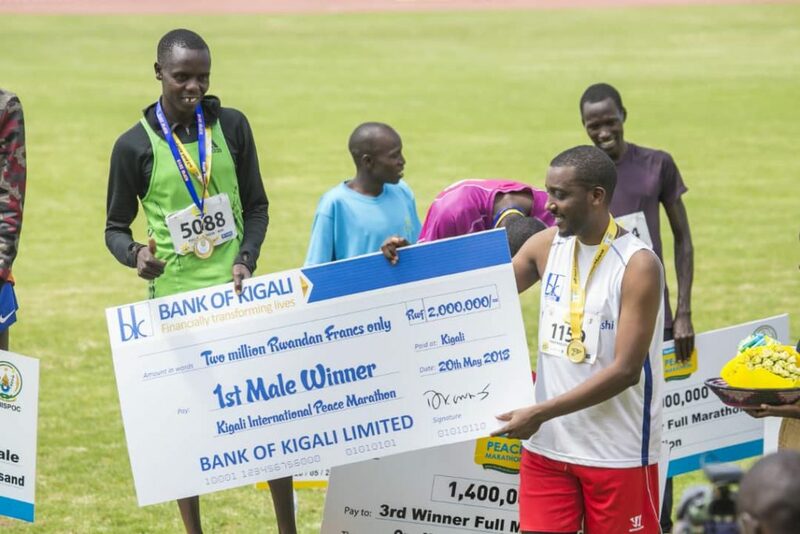 The1st male winner walked away with Rwf2,000,000 cheque. In 2015, Jean Baptiste Ruvubi came close to making history but finished second behind gold medalist Ezekial Omullo Kemboi of Kenya, who used 2 hours, 18 minutes and 15 seconds. 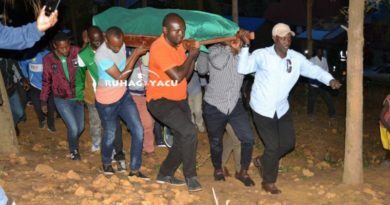 This year, it was a Kenyan affair as Yego Elkana Kibet, Kibet Rono Kenneth and Jones Omar Onyambu ensured a 1-2-3 finish to win all accolades of the day in the men’s category. The best placed Rwandan in the full marathon was Gilbert Mugiraneza who finished in ninth position after clocking 02h29:49. Minister of Sport and Culture Uwacu Julienne participated in awarding ceremony. In the women category, a replica of the men’s affair was interrupted by Uganda’s Chelangat Priscilla winning a bronze medal to come behind Kenyan pair of Beatrice Jepkorir Rutto and Caroline Jeruto who won gold and silver medals respectively.